While the practice of Kundalini yoga may seem intimidating to some, others embrace its spiritual foundation and meditation techniques. 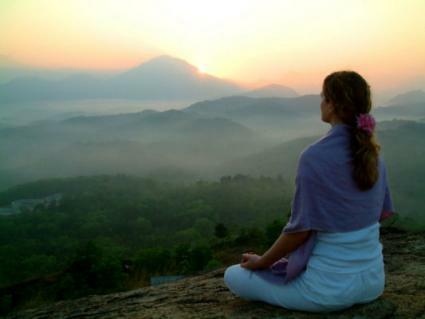 The practice of Kundalini meditation can add a powerful dimension to your routine. The purpose of Kundalini yoga goes far beyond the basic asana to draw out stored energy within the body to increase awareness. In addition to postures, practitioners incorporate breathing exercises, chanting, and meditation. The ancient yogis believed that everyone has a core of power deep within. In the Sanskrit language, Kundalini means "she who is coiled", in reference to the power ready to be released. When individuals use specific techniques to awaken this energy and direct it through the seven chakras of the body, it will bring about enlightenment. The methods of Kundalini meditation are designed to relieve your mind of the myriad messages it processes each day and help you to become more clear and aware. Many people experience deep healing and empowerment through these techniques. The general process for this type of meditation is as follows. Start by encouraging your body to enter the present state. Get into a comfortable position, using a cushion or folded blanket if desired. Create a synergy between your heartbeat and your breath by allowing both to follow your natural body rhythm. Your thought is enclosed in a bubble. When the bubble pops, the thought goes away. Place your thoughts on the sand at the ocean's edge. When the water washes over that spot, it carries your thoughts with it. As a thought enters your mind, use your next exhalation to make it float out of your mind. Guided meditation is also a helpful way to learn Kundalini techniques. On YouTube, Kelly Howell has created a four-part series called Awakening Kundalini. Parts one and two explain the practice, and parts three and four are the actual meditation, split into 15-minute segments. Also on YouTube, you can try the Third Eye Kundalini Meditation provided by Alchemy Sound Therapy. On Experience It Now, you can choose an audio or video guided meditation conducted by Shri Mataji Nirmala Devi.